Residential Coatings can be installed on driveways front and back patios and side walk surfaces..
Commercial Industrial and Commercial Flooring for Restaurants, Aircraft Hangars, Kitchens, Studios.. Floor Preparation Providing a quality epoxy floor installation begins with proper surface preparation..
Painting & Sealing Stains & Varnish, Painting, Texture & Drywall Damage Repair, Surface Preparation.. Specials! First Class Coatings Will Beat Any Licensed Lowest Bid! Welcome to First Class Coatings, Inc. Since 1990 in Arizona. We pride ourselves in the installation of the best looking, maintenance free, easy to clean floor coatings & painting services! To offer a complete painting, decorative concrete & epoxy flooring company that will be superior to that of our competition. We are a company that follows a strict code of ethics. Our crews are dressed in professional uniforms. We provide detailed estimates and clearly written contracts. We have clean, logoed trucks, and congenial servicemen. To provide the client with feeling of extreme Value— "Getting more than what you pay for." A company that will do what they say they will do, while delivering Guaranteed Start and Finish dates. At First Class Coatings, we understand your services needs and will make every effort possible to exceed your expectations. 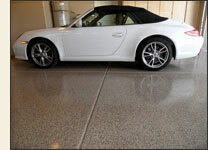 First Class Coatings has installed over 5000 floor coatings since 1990. • Guaranteed against hot-tire pick-up. • Professional tools used, manufactured for the industry. • Installations mastered by certified applicators. • Fully licensed, bonded, and insured work. • Satisfied clients who take pride in showing work done right! We want your coatings project to be our next! For a coatings installation, you don't need to own a fancy car, merely the desire to have a beautiful transformation from the dreaded, un-attractive garage space. The new, gorgeous extension of your home will be your "garage". To provide superior quality coatings system, at the most competitive price. Epoxy, Urethane, polyaspartics including the coatings of aircraft hangars, restaurant floors, kitchen quartz broadcast floors, food and beverage floors, health care and hospital floors, machine shops, car dealer - service centers, warehouse floors, storage rooms, industrial flooring systems, epoxy mortar overlay, meat and packing plants, manufacturing floors, garage floors, patio floors, simulated granite floors, solid color epoxy floors, residential, commercial, industrial applications of all sorts, clean rooms, electro-static dissipation, water treatment, water containment, veterinarian floors, concrete sealers, exposed aggregate sealers, acid stain and polymer overlay flooring. Kool Deck coatings, elastomeric roof coatings. Ceramic coatings, coating removals and diamond grinding, shot blasting, protective coatings, solvent based epoxy, water based epoxy systems and all resinous flooring systems. We do the job properly—the first time. This includes guaranteed beginning and completion dates. We are certified epoxy coatings and painting specialists offering "exceptionally high quality" epoxy floor coatings, installation, and painting. Your floors are not our practice field - installations are preformed by seasoned professionals. 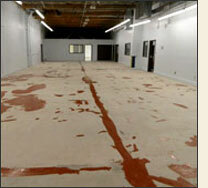 We specialize in residential, commercial, and industrial epoxy floor coatings and painting services. Our clients are serious about having a job performed well - so is First Class Coatings. Our surface preparation is the most detailed and thorough in the Valley. We will answer and return your calls the same day. Have Your Floors Installed Properly! Utilizing the "Right Tools" for coating installations sets us apart from the competition. Applicators with a minimum of 8-16 years of experience. New installations, coating removals, and re-installations. Certified Applicators who pay attention to the details. Kool Deck coatings and acid stain flooring. 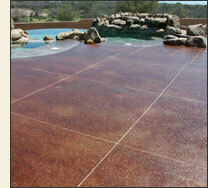 Concrete overlay systems and Design. Flagstone, pavers, exposed aggregate & concrete sealers. (Green) VOC. compliant coatings — call for details. Let us prove why First Class Coatings, Inc. should be your professional coatings installation company of choice. When you want the job done right the First time, on time, you will be happy you called us first. First Class Coatings Inc. © Copyright 1990-2012, All Rights Reserved.